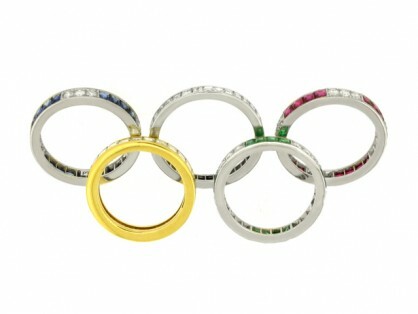 At Berganza we are always interested in antique rings and, especially in light of the London Olympics, the Olympic rings are no exception! Though the modern Olympic Games were established in 1896, the now widely recognized symbol of the Olympics—the five interlocking multi-coloured rings—did not come into use until 1913. The symbol was designed by Pierre de Coubertin (1863-1937), the man behind the re-establishment of the games. The design first appeared in the form of a hand-coloured drawing at the top of a piece of his own plain letterhead. In this earliest version the rings were linked in a single curved row, but soon they were rearranged to appear as they do today, interlaced to show the universality of Olympism. The five rings were meant to represent the five continents, whence came the competing nations. In fact, part of the reason the symbol did not come about until 1913 is that it was only in the 1912 Stockholm Olympics that athletes from five continents came to compete. The six colours—blue, yellow, black, green, red and the white ground—were meant to represent the flags of all nations. We wish all of the British athletes in this year’s games the best of luck.